Contemplate an outdoor area that is chic, stylish, and reflects your unique personality. It is one where every piece has a purpose and is chosen for its beauty and performance. The Sunn Tray Coffee Table from Design Warehouse is one such unique product that you’ll have modernised your area effortlessly and instantly! A striking matte black aluminium material is configured into a stupendous design that is in keeping with the simple, chic looks of the 21st century. 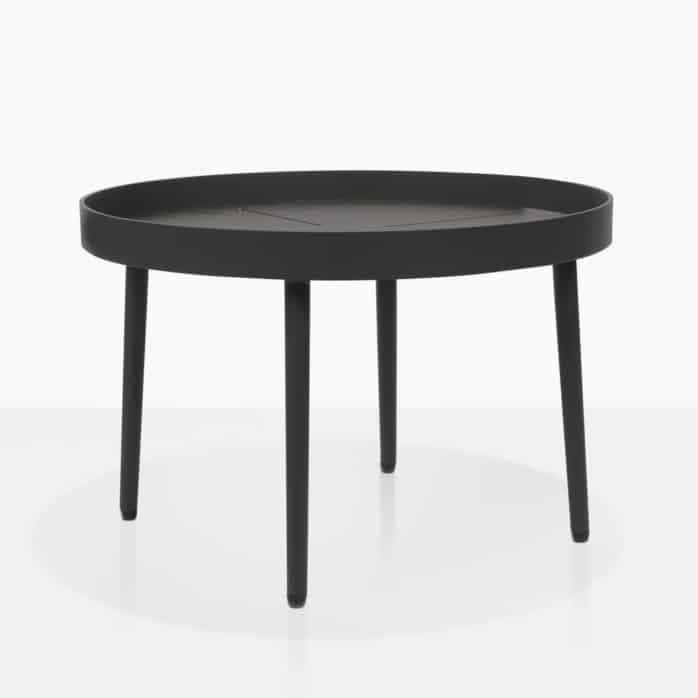 A rounded table top with angular, geometric patterning that includes a take-away tray table, while the slender legs give the Sunn Coffee Table an easy, graceful presence that makes it a style that can be incorporated into many styles of area! Set this extraordinary Sunn Tray Coffee Table up in amongst chunky teak deep seating with soft Sunbrella® cushions for a fabulous and demanding dignity through the fraternisation of materials and style. Perhaps your outdoor area is limited to some relaxing chairs for space – this is the perfect table that packs a punch in the style department but is lightweight and airy enough to not overwhelm an area! We also recommend the Sunn Coffee Table for indoor use – imagine this gorgeous piece in amongst your leather furniture and soft fabrics – another amazing example of outdoor furniture styles having versatile uses! The Sunn Coffee Table is made from distinguished black matte powder coated aluminium. A look that is remarkably stylish but also has excellent protection from the elements. Aluminium needs very little maintenance – simply follow the care instructions on our website and you will have incredible furniture in wonderful condition for many years to come! Our Sunn Collection also features a stunning side table, so you can mix and match as you see fit! Call Design Warehouse today to order your fantastic new Sunn Coffee Table and change the way you relax… in style!